Top 10 Best Telescopes in India 2019 - Top 10 In India - Only The Best of everything! LATEST product list, updates regularly! 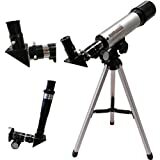 If you are planing to buy a telescope or are an experienced user of telescopes who wants to buy another one, this list of the top 10 bestselling telescopes in India is a good place to begin. Telescopes are very specialised devices and what someone else likes may not suit your purpose at all. That is why you need to explore a bit before you buy. 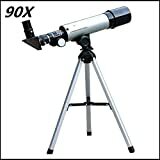 However here are some basic tips for buying a good telescope that will fulfill your objectives. The first decision you need to make is whether you will be doing more of astronomical viewing, meaning looking at the night sky and heavenly bodies, or terrestrial viewing, meaning looking at distant objects on earth. 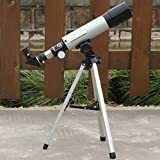 You should not look for a telescope that will do both for you for the simple reason that a terrestrial telescope does not function well as an astronomical telescope and vice versa. The second factor to consider is the aperture of the telescope. The bigger the aperture, the more the light that comes into the telescope and the clearer the image. However if you go in for larger apertures, the size of the telescope increases. The third factor to consider is the magnification. However one point we should note is that the magnification is decided by the eyepiece, and we can get a new eye piece with higher magnification for the same telescope, so this should not be a defining factor. The fourth thing to consider is the type of telescope that you are buying. You can choose between refracting telescope which is the most common and uses a lens, a reflecting telescope which uses a mirror and a Cassegrain telescope that uses both lens and mirror and is a modern version. Now that you have some idea of telescopes, go ahead and choose one from the top 10 bestselling telescopes in India. Go ahead, choose a telescope that the world trusts. Spectacular Magnification of 18X - 90X. See The Night Sky and Natural World In More Detail. Porro Prism for Reflecting Mechanisms to Create Unique Pathways for Light. Metal Optical Tube, Metal Tabletop Tripod & 2 Eyepieces. 360mm Focal Length for Distortion Free Images. 50mm Lens Diameter. Monocular Telescope for Viewing with One Eye. Package Includes 1 Telescope with Accessories, Operational Manual and a Plastic Molded Carry Case. Monocular Telescope For Viewing With One Eye.